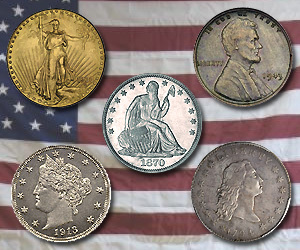 The US has produced a large number of coins in its history, with many of them discontinued due to age or mint errors, and sometimes even as part of a change in government policies. Various collectors around the world now possess many of these historic coins, and some of them are so rare that for a long time their existence was considered folklore. However, the advance of time and the growing interest in numismatics has brought some of these rare coins back into the fore, as more people start to dig them out of their collections. 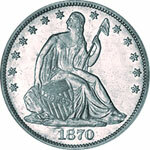 Below is a list of some of the rarest US coins you can find to date and their values. This is one of the rarest coins in existence and is one of the only coins on this list that almost never saw the light of day. In 1933, the US was in the middle of the great depression. In an attempt to end the 1930’s bank crisis, President Roosevelt issued an executive order discontinuing the gold standard, and making the possession of gold coins, gold bullion and gold certificates illegal for the public. 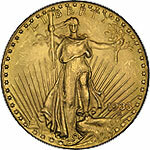 This order came after the Philadelphia Mint had produced 445,500 specimens of the Saint-Gaudens Double Eagle 20 dollar gold coins. This meant that the coins never made it into circulation and were destroyed in late 1934 instead. Officially, only two coins were spared destruction, both of which were presented to the US National Numismatic Collection by the US mint. However, the staff at the Mint managed to smuggle 20 coins out, saving them from the melting process. The theft was discovered in 1944, and the US secret service managed to recover 19 coins. Nine of them were destroyed, while 10 are in storage after being seized in 2005 by the government. The only known specimen in private hands is one that was bought by King Farouq of Egypt in 1944, just before the theft was discovered. It disappeared when he was deposed in 1952 but in 1996, the coin resurfaced again. The US government regained possession of it after an agreement was reached with the dealer in 2001. The government sold the coin at an auction to an anonymous bidder for $7.59 million, making it one of the most expensive coins in existence. 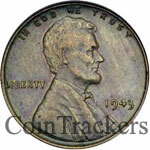 This coin, also known as the 1943 copper wheat penny is one of the rarest in the Lincoln cent series. Only about 40 of these coins were struck after an error occurred during the transition from copper to steel blanks. This error was discovered after World War II but to date only 12 have been confirmed to exist. There have been numerous counterfeits created, either by modifying the dates on coins that were released later in that decade or by copper plating steel coins from the same year. The best way to test the authenticity of the coin would be to use a magnet, as the copper-plated coins are highly magnetic. A mint condition copper penny sold for over $200,000 in 2004 and the average value of the coin has been pegged at about $60,000. This five-cent coin was struck in very limited quantities as it was done without the approval of the US mint. It is one of the rarest and most coveted coins in numismatic circles, with only five examples ever being produced. Three of these are in private collections while the other two are in museums. This coin series has broken very many records in the past. The first coin to break the $100,000 barrier was a 1913 Liberty Head Nickel in 1972, as was the first coin to break the $1 million barrier in 1996. The most famous example of the 1913 Liberty Head Nickel is the Olsen nickel, named after the famous numismatist Fred Olsen. Although it is not the best-preserved specimen in the series, it has the richest history, having changed hands numerous times since Olsen sold it to King Farouq of Egypt in the 1940s. It has even made an appearance on prime time television, having been the subject of an episode of Hawaii Five-O in 1973. When it came up for auction in 2010, Heritage Auctions sold it for over $3.7 million to an anonymous bidder, making this one of the most expensive sales of the 21st century. 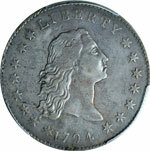 The flowing hair silver dollar was the first dollar coin to be issued by the US federal government. It was struck for only two years, 1794 and 1795, and was replaced in October 1795 by the draped bust dollar. Its size and weight are based on the Spanish dollar, which was commonly used in trade in the Americas at the time. The series has been considered by numismatists to be one of the most valuable coins of all time. From as early as 1880, the flowing hair dollar has been dubbed as one of the most expensive and coveted collector’s items. Previous owners have even called it a national treasure, due to its importance to American history. The last time one of these coins was brought under the hammer it was sold for over $10 million, making it the highest-valued coin in history. One of the things that make this dollar so unique is that it is unlisted in any mint reports in the country. They were struck in San Francisco just after the construction of the mint there was completed in 1870. Two reverse dies used to strike the coins were delivered by the Philadelphia mint without mint marks, necessitating the return of the dies to have this error corrected. Speculation as to why the coins were struck without the mint marks and before the error was corrected, seems to suggest that the coins were struck with the intention of them becoming presentation pieces to be inserted in a cornerstone. Twelve of these coins are said to be in existence, with one having been sold for just over $1 million at auction in 2003.